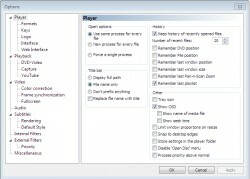 Media Player Classic - BE (aka MPC-BE) is based on the original "Media Player Classic" project (Gabest) and "Media Player Classic Home Cinema" project (Casimir666), contains additional features and bug fixes. Playing various video and audio files. Support for hardware decoding and deinterlacing. Automatically mount ISO images. Added support for metadata written in json format. Fixed playback of very small files. Added support for Xunlei XV files. Added support for mixed H.264 3D MVC streams. The initial size of the read data for local files is increased to 60 megabytes if there is a HEVC stream in the PMT. Added support for MPEG-PS with mu-law streams. Improved navigation on files with corrupted blocks. Added support for the 'r210' video codec for MOV files. Added support for trimming the frame (atom 'clap'). Added support for MP4 dash files, with separate segments for each track. Added support for Avid DNxHR video ('AVdh'). Added color space support (atom 'colr'). Added support for HDR Light Level (atom 'clli'). Added support for HDR metadata (atom 'mdcv'). Added full support for DAV (DHAV) files. Always decode DTS Express streams to PCM. Improved DTS-HD HRA bitstream compatibility. Changed the format of the brightness, contrast, hue and saturation. 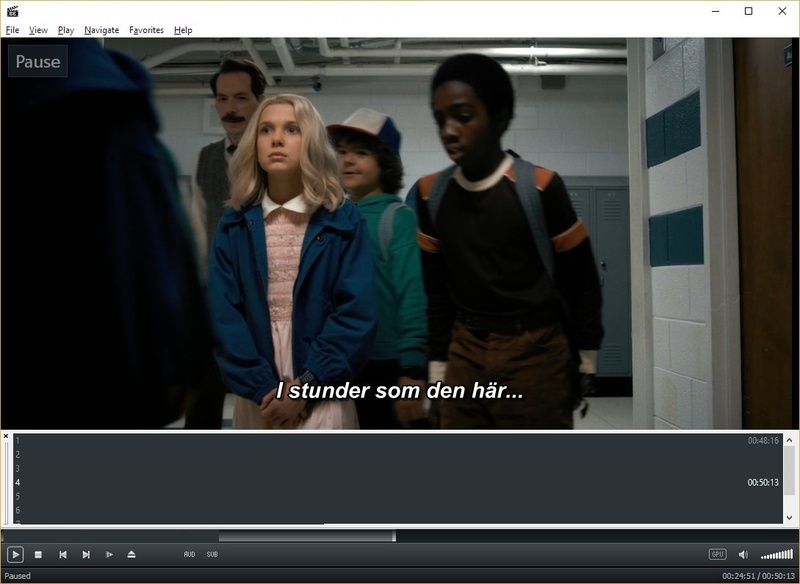 The filter built into the player is now only connected for DVD-Video. In other cases, for MPEG-1 and MPEG-2 MPCVideoDec will be connected. Removed option "H264 deblocking disable method". Corrected row order when converting RGR to RGB32. Added support for AVrp codec (Avid 1: 1 10-bit RGB Packer). Improved support for getting color space from the upstream filter. Added support for the HuffYUV MT codec ('HYMT'). Added patch, any I-frame in the H.264 stream is defined as a keyframe. This speeds up navigation on some files. Added support for "Mirillis FIC" video ('FICV'). Accelerated decoding AV1. Now dav1d v0.2.0 library is used. Added support for 'Y1  ' (16-bit gray). Removed direct support for planar RGB48, now planar RGB are supported only through MEDIASUBTYPE_LAV_RAWVIDEO. Fixed status display during bitstream and audio track switching in the player. The buffer size is calculated more correctly when the DTS-HD is used. The option "Do not check format support" has been expanded. Changed the mechanism and synchronization settings. Improved the quality of screenshots of anamorphic frames. Correction shaders are also used when creating screenshots and thumbnails. The size of very large subtitles is limited, otherwise they are incorrectly displayed. Correct the output of unsupported characters. Improved work with live broadcasts. Fixed FlyBar when choosing Hebrew translation. 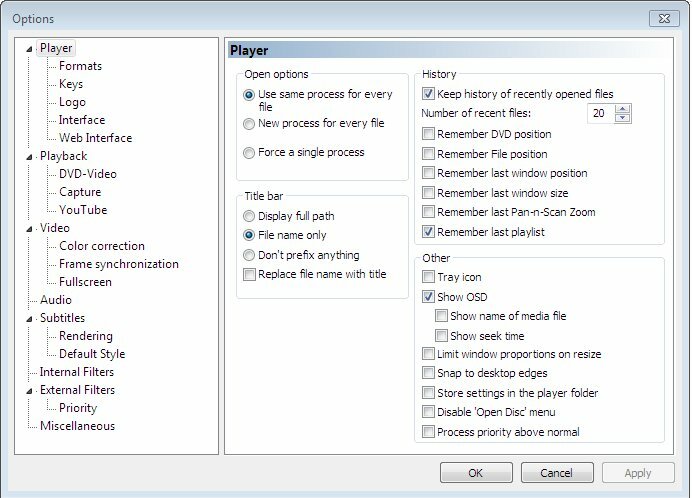 Improved definition of the choice of the main video when opening a Blu-Ray structure. Added the ability to assign a hotkey to the "Open Iso image" command. Improved automatic display mode switching. When the display is turned off, the settings are not lost. The page "variables.html" of the web-interface has been improved. Playlist now supports dark theme. Improved playlist rendering at high DPI. Fixed the operation of the button for resetting the list of media types for filters loaded on the file path (not registered in the system). Fixed the "Exclusive fullscreen" option when switching via "FlyBar". Fixed the calculation of the window size when the "Limit window proportions on resize" option is active and the active playlist stuck to the left or right. Added the ability to increase the font size in the playlist. Added a command to get MediaInfo data in the playlist menu. The AC3 / DTS format group and the DTS / AC3 &#8203;&#8203;filter group are divided into the AC3 and DTS / DTS-HD groups. Added support for ".dtsma", ".eac3" and ".weba" extensions. 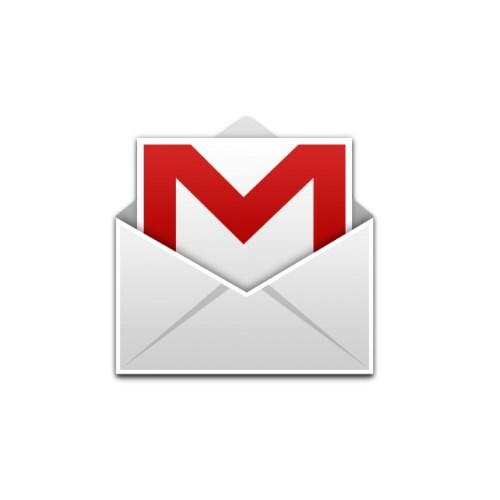 The ability to save up to 1000 bookmarks for media files is returned. Added support for the option "Allow Windows to fix blur in applications", which appeared in Windows 10. Settings item "Null (compressed)" renamed to "Null (any)". Implemented getting the disk name from the file "BDMVMETADLbdmt_eng.xml". Increased buffer size for open file dialog. Added the ability to use multiple playlists. Added new "Explorer" playlist type. Added the ability to search in the playlist. Added support for BMP format for audio covers. Download MPC-BE Portable download from the Download links under Download and Download other versions! No comments. Rating it only. On Windows 10 version 1809 (OS Build 17763.348) when in compact or normal mode full screen is not working correctly, but in minimal mode it works fine. Why don't you put this icon pack in the installer? Version number / Beta version number / Update version number and when it whas released. NO MORE UPDATES? = The software hasn't been updated in over 2 years. NO LONGER DEVELOPED = The software hasn't been updated in over 5 years. RECENTLY UPDATED = The software has been updated the last 31 days. Freeware = Download Free software. Freeware Trialware = Download Free software but some parts are trial/shareware. Free software = Download Free software and also open source code. Free software Trialware = Download Free software and also open source code but some parts are trial/shareware. Freeware Ads = Download Free software but supported by advertising, usually with a included browser toolbar. It may be disabled when installing or after installation. Free software Ads = Free Download software and open source code but supported by advertising, usually with a included browser toolbar. It may be disabled when installing or after installation. Trialware = Also called shareware or demo. Free Trial version available for download and testing with usually a time limit or limited functions. Payware = No demo or trial available. Portable version = A portable/standalone version is available. No installation is required. v1.0.1 = Latest version available. Download beta = It could be a Beta, RC(Release Candidate) or an Alpha / Nightly / Unstable version of the software. Download 15MB = A direct link to the software download. Win = Windows download version. It works on 32-bit and 64-bit Windows. Win64 = Windows 64-bit download version. It works only on 64-bit Windows. Mac = Mac download version. It works on 32-bit and 64-bit Mac OS. Mac64 = Mac OS download version. It works only on 64-bit Mac OS. Linux = Linux download version. Portable = Portable version. No installation is required. Ad-Supported = The software is bundled with advertising. Be careful when you install the software and disable addons that you don't want! Visit developers site = A link to the software developer site. Download (mirror link) = A mirror link to the software download. It may not contain the latest versions. Download old versions = Free downloads of previous versions of the program. Download 64-bit version = If you have a 64bit operating system you can download this version. Download portable version = Portable/Standalone version meaning that no installation is required, just extract the files to a folder and run directly. Portable version available = Download the portable version and you can just extract the files and run the program without installation. Old versions available = Download old versions of the program. Version history available = Complete changelog on our site. = Mac OS version available. Our hosted tools are virus and malware scanned with several antivirus programs using www.virustotal.com.